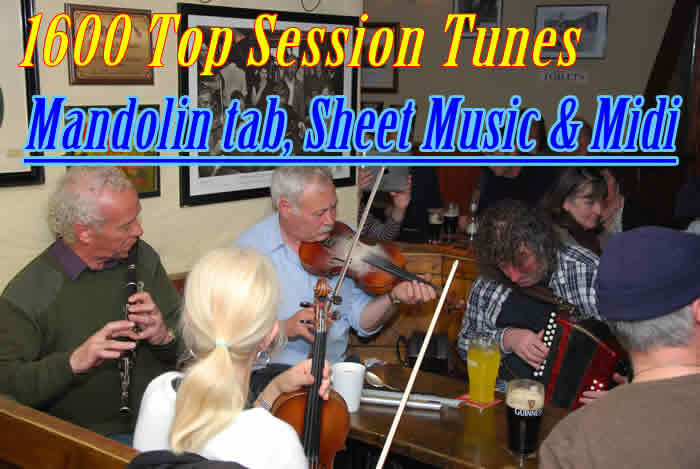 Tunes for Musicians and bands playing in sessions, from Irish, Bluegrass, Old-time, Appalachian, English, Canadian, Scottish and European Traditions, with Downloadable, Printable, Free Sheet-music, Tabs for Mandolin, Midi Backing tracks and mp3. The songs are accessed by clicking on a letter on the above nav-bar, A for songs beginning A etc. See below for full titles list. THIS COLLECTION INCLUDES MORE THAN 1600 SCORES with sheet music and tabs for mandolin plus midi files of the tunes. The tunes are mostly ones commonly played in music sessions from the Irish, Bluegrass, Old-time, English, Canadian, Scottish and European Traditions. For the Tabs GDAE (standard) tuning for the mandolin is assumed. The versions here are not intended to represent any particular version or performance and are provided for educational purposes only. As with most traditional music, a process know as "folk processing" occurs, which can result in many different versions of songs and tunes, so you may find more than one version of a tune listed here. Need a particular song or arrangement to buy? Checkout The Session Tunes Collection at Sheetmusicplus, (opens new page) they have one of the largest selections of music books and sheet music available anywhere. Their site also has good search facilities to find what you want, AND include content indexes for most their music books. Multi page scores: Some of these tunes are quite long and may extend to 2 or 3 pages, in these cases only the first page is displayed on the web page and to view all the pages, you will need to download the PDF file for that tune, see below. Listen / Practice the tune: Each tune is provided with a download link to a midi file which can be used as a backing track for practicing the tunes or just so you can hear what the tune sounds like. The Midis are mostly at a slowish temp to make them easy to play along with. PRINT OUT: Free Scores are are provided for each piece, so should you need a print-out of the song, PDF versions (without banners or adverts) are available to download from the link at the bottom of each song page. This is a list of all the lyrics available in this section, click on A,B, etc in to top nav-bar to go to the song pages or on "session-mandolin-tab" to return to this page. Use control F to search this page in your browser. Youre A Grand Old Flag! You Married My Daughter Yet You Didnt! - such as Charlie Poole, Ernest Stoneman, Brad Leftwich etc, also with downloadable PDF and RTF versions. Also with guitar & mandolin tabs and downloadable midi tracks and PDF versions. Includes many old-time tunes, also with downloadable PDF versions. Country, Bluegrass and Southern Gospel songs, 1700+ lyrics,chords & PDF The Play-party In Indiana, Traditional songs and games, notes, sheet music & lyrics 700 Old American Songs, folk,old popular & religious music genres, lyrics+PDF 'A full definition of old-time or 'oldtimey' music.